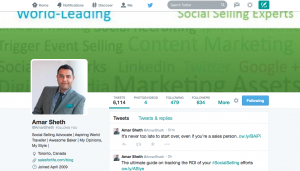 TSE 072: Social Selling Practices That Will Drive Results For You Today | The Sales Evangelist! 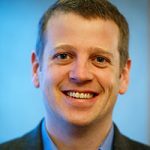 TSE 072: Social Selling Practices That Will Drive Results For You Today! 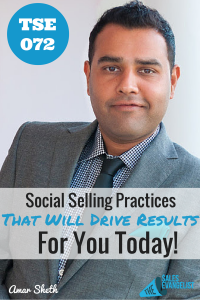 Home » TSE Podcast Post Page » TSE 072: Social Selling Practices That Will Drive Results For You Today! In this episode I interview Amar Sheth who is a Principal at Sales for Life. Amar has over a decade of digital marketing experience and currently educates sales professionals like you and me how to effectively use social media to generate leads. 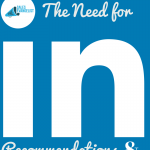 There are many sales professionals who have a LinkedIn and Twitter account, but they are not using them properly to connect with qualified prospects. Why? Because they don’t know how to start. Amar shares with us the basic principles on how to take advantage of social media TODAY! Sellers should go in with value FIRST! Learn to deliver value first and then you will have the right to ask for the sale. Social selling allows us to deliver value more than ever before and more consistent than ever before. Sales is human to human interaction, not a transactions between brands. 57% of the buying process is done online before the buyer even contacts the sales professional (corporate executive board). Buyers today are just like you and are doing research online. You will be engaged at the late stage of the game. You will have no opportunity to add value because you are not the first to bat. The discussion will generally move onwards price and commoditization very quickly. Best way to engage with buyers today is through content (information). 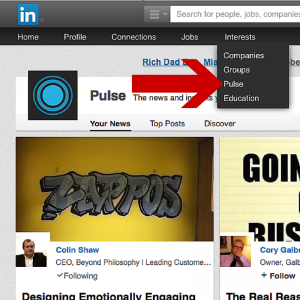 Sellers can share content (information) on LinkedIn and other social media platforms. “The guy that hustles the most, is the guy that catches the loose ball” -Will Smith. Find content that matters to your buyers and repurpose that information. Find the industry leaders, follow them and share the content that they share. Be consistent with the information you are sharing online. Follow your top 10 best prospects. Follow individuals in the organization.